Immediately upon the arrival of the Crayola Fashion Superstar kit I knew who I wanted to gift this to. Our boys have a group of girls who I knew this would be totally suited for. They range in age from 5-10 and love all things fashion. We were lucky enough to get their thoughts on this product and I got to see it in action during a small cookout that we attended when I decided to gift this early. Yes, I stink at keeping gifts and I wanted to know what they thought to add to my review. They had no idea that I would be keeping track of their opinions at all, so I got some real unbiased opinions. The 5 year old was not quite as interested in the designing ideas, but loved the idea of coloring in the outfits inside the design book. 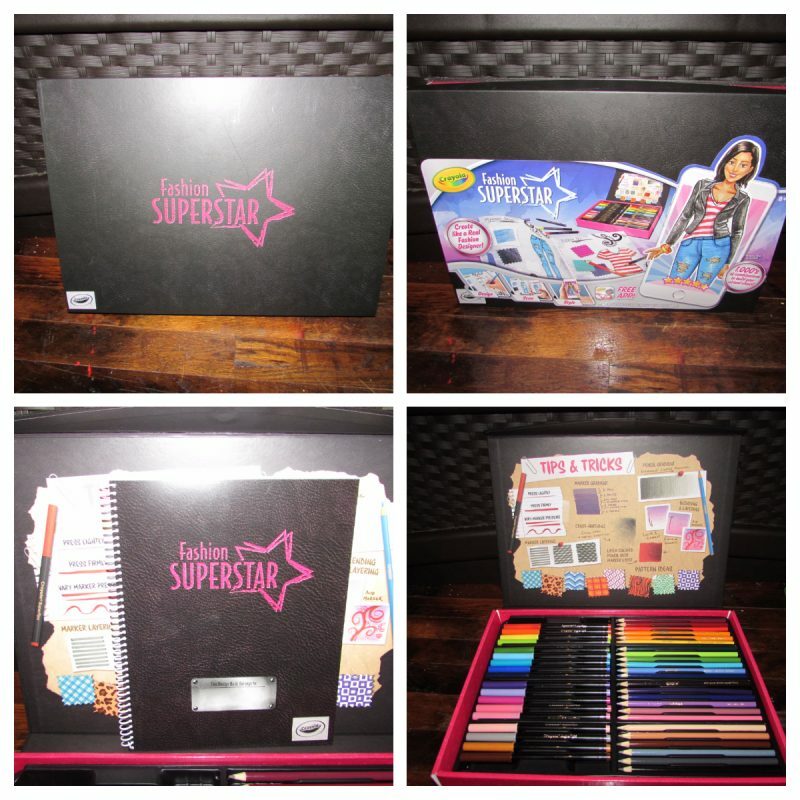 She loved how many markers and colored pencils came with this set and knew they could be used on other projects as well. The 7 year old set to making brightly colored projects right away and the dress ideas that she had were really something to behold. What I loved most was the reaction of the 10 year old. She has a true passion for fashion and she jumped in with both feet looking at the designs and getting really curious about what she could create and manipulate from outfits she had seen in other places. We did not download the app, but instead just enjoyed the creativity in the privacy of a home setting but I think for older kids (preteens and older) this would be a great thing to do. The ideas for this design book are absolutely endless. I love that the kit comes in such a great storage case and looks really professional for even the youngest of fashion designers. Priced at $19.99 on Crayola.com it is recommended for ages 8 and up and I definitely saw that the younger ones struggled with seeing the true purpose of this kit while the older of the girls really dove in and treasured her creations. This and other Crayola products have been featured on our 2017 Holiday Gift Guide as great gifts for children of all ages! Crayola is such a timeless brand that each year we like to include gifts for our own children and friends of our kids.